HYGIMAX™ is a smooth textured hygienic lint free wiping roll. 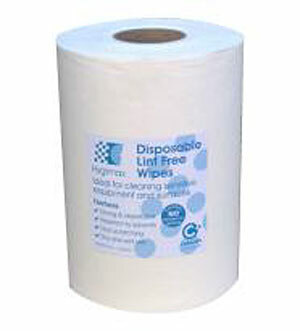 This is a wipe designed specifically for cleaning sensitive equipment and surfaces. Ideal for all professional and hygiene applications. Made from tear resistant fabric making it ideal for cleaning any surface. High surface softness ideal for Plexiglas, screens and sensitive equipment. Great for pre and post sterilizing. This lint free cloth contains no silicone or binders. 400 Sheets per roll 30 x 38cm. Colour – White or Blue. Areas of use - Medical, pharmaceutical manufacturing, lab hi-tech, food.